From his earliest experiments, Ron Vale has investigated the movements that make life possible: the productive growth of plants, the division of cells, and the transit of signals through the long axons of neurons. 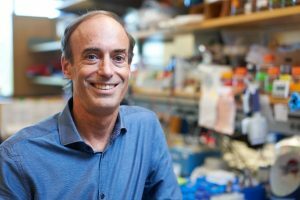 His work, both within the laboratory and beyond, is marked by a persistent momentum: He thrives on the pursuit of new opportunities to advance his field and the broader enterprise of science. As a postdoc he identified the force-generating protein kinesin, and later determined how it converts chemical energy into mechanical energy. Vale and his colleagues have also made key discoveries about the molecular motor dynein, which allows sperm to swim using a whip-like flagellum; and katanin, which is critical for reorganizing the microtubule cytoskeleton during cell division. In recognition of this work, Vale shared the 2012 Albert Lasker Basic Medical Research Award and the 2017 Shaw Prize in Life Science and Medicine. What were some early experiences that you put you on the path to becoming a scientist? My parents were involved in writing and the film industry. They were interesting individuals in the sense that they were very widely read—including philosophy, literature and the sciences. And even when I was in preschool my mom would take me to science museums, and I loved them. I developed a wide interest in life, the universe—all the major wondrous things that were in the world. One direct experience that was also a pivotal point was doing research myself. In high school we had a mandatory 10th grade science project, which I took well beyond the minimal requirement. I was interested in biological clocks, and so I set up the basement of our house as a laboratory to do experiments on the leaf movement of bean plants. I built a little apparatus that would measure the leaf movement and was doing some experiments with how light-dark cycles could influence it. I had a great high school counselor, and she knew how interested I was in this project. She ended up calling UCLA, which I would have never done on my own, and asked if there were resources for me to do this work in a more serious laboratory. I ended up working there for my junior year to further that research, and then that same high school counselor found about the Westinghouse—now it’s called the Regeneron Science Talent Search. I was selected as one of the top 40 kids in the country. I went to a school where academics were not a first priority, and I realized that there was a whole other peer group who was interested in science—that was very stimulating for me. Another big transition point was understanding that science is not about mastering equations or memorizing material; it’s a field of asking questions and exploration. Once I realized that I could participate in that inquiry, I think that just flipped the switch. How did you come to study molecular motor proteins? A lot of fortuitous circumstances got me into the motor protein field. Part of my project [as a Ph.D. student at Stanford] was on understanding nerve growth factor receptors. Nerve cells extend processes called axons that innervate, for example, muscle or other tissues, and there are signals from the periphery that tell the nerve cell nucleus, where the DNA is, that the cell is hooked up to the right place—because the DNA is actually located quite far away from where the nerve terminal is. One of those signals is a hormone called nerve growth factor, and I was studying how it interacts with receptors on the outside of the cell that bind that hormone and then send the signal. But there was another question that interested me: How is the signal actually sent down that long tube, the axon, back to the nucleus where the DNA is? That was known to be a process called axonal transport, but it was very poorly understood. I was interested in how that signal from the nerve growth factor got inside of the cell and all the way back to the nucleus. Honestly, that question still remains poorly answered today. Downstairs from my lab at Stanford, Jim Spudich and Mike Sheetz were developing a system to study muscle contractility in a test tube environment, and it seemed to me that there might be some interesting parallels between axonal transport and this motility system. I ended up connecting with Mike Sheetz, and we were initially going to study this at Stanford. I thought the squid would be a good system because it has a long history in the neurobiology field for understanding how electrical conduction works inside nerve cells, and it has a giant axon, which we thought would be useful for this problem of axonal transport. We were hoping to get squid from [Stanford’s] Hopkins Marine Station, but that year there was a meteorological disturbance which subsequently was labeled El Niño, where the water warms. We couldn’t get squid that year because they had disappeared from the coast of California, and that led us to go to Woods Hole [Marine Biological Laboratory, in Massachusetts] to carry on that work. That proved to be a very important environment for doing all of the work that transpired on motor proteins and axonal transport. Why did you decide to start iBiology, and how has it influenced science communication? The genesis of iBiology was an idea that was floating in my head for a while: that there had to be more equity in how the science communication process works. That really struck home when I went on my first trip to India in 2006. I flew halfway around the world, and I spoke at the most elite institute in India, to 150 people, which is a very typical seminar experience. Somehow the starkness of that experience—flying at considerable cost and amount of time to a country that has a billion people and talking to 150 people at the most elite institution—focused my thoughts on this issue. There had to be other ways to communicate science that would allow more opportunity than the privileged exchange from one elite institution to another. And of course, the internet provided that kind of opportunity. When I got back home I got a small grant for $2,000 to pilot some ideas about how we could film scientists in a studio environment, and whether that would be an interesting additional communication mechanism that would reach more people. The project has had a history of bootstrapping up from that humble beginning. Now it’s pretty well recognized around the world. I just went to India, and it’s gratifying to go there and hear from a lot of people who say, “I love your series. I watch it myself. I tell all my students to watch it.” That’s what the whole project was always intended to be about: reaching folks who normally wouldn’t have that kind of access and inspiring a lot of people. Where are you going next with iBiology? The core audience for iBiology spans from college students through postdocs, but there are also high school students and senior principal investigators who watch it. I think the spirit of iBiology is that scientists need to take responsibility of how we communicate our work. The same spirit is behind our new effort to produce a popular film on genome editing. We’re trying to spearhead a deep collaboration between scientists who know the science and people with talents that we don’t have: storytellers, videographers, cinematographers, film editors. We’ve been fortunate to recruit some really talented people in that area, most specifically Elliot Kirschner who’s worked with Dan Rather [who serves on iBiology’s board of directors]. It’s an experiment in content, but also in how that content is being made in this filmmaker-scientist collaboration. It’s going to be an interesting and important effort on multiple levels. What issues are you trying to address through your work with ASAPbio to encourage the use of preprints in the life sciences? The whole process of science and how it advances centers around how people communicate new findings to one another and how those findings are reinterpreted and built upon by new experiments. ASAPbio started when I asked myself about the way we communicate our work through papers: Have we really optimized how we can communicate our scientific work? A number of changes have made scientific communication, in terms of publication, less desirable now than when I was a Rita Allen Scholar, and those trends have had, in my and a lot of other people’s opinions, a negative impact on young scientists. I’m quite concerned about what we leave behind for young scientists, and creating the kind of culture that I remember having when I was starting out, which was a feeling of excitement and a “full steam ahead” attitude. I had a very brief training period, and I got to independence very quickly, but what I’ve seen happen in our profession is that the time to independence has gotten increasingly lengthy. The time to produce papers is lengthening. The worry around scientific communication in terms of publication has increased enormously. Sometimes I talk to young scientists, and I tell them how excited I was to send out papers when I was a graduate student or a junior faculty member. People smirk or laugh as if they can’t believe it was actually ever true. I think that’s just fundamentally wrong. I still believe that scientific communication should be a joyous process, a culmination of an enormous amount of work. I think this is another case where, to some extent, the scientific community itself has lost control of the steering wheel, and we haven’t paid attention to it as much as we should. ASAPbio started off as nothing but a conversation, and it’s now developed into a nonprofit organization, very much a bootstrapping process like iBiology. Since ASAPbio came into being just two years ago, a lot of positive things have happened in scientific publication and there is a lot of energy from people who are starting to rekindle this interest in moving scientific publication forward in healthier directions for the community.